There are a few movies that have served as “touchstones” for me. They put me in touch with things I had forgotten or revealed aspects I had never before considered. It’s a Wonderful Life reminded me that each of our lives touch so many others. Field of Dreams showed me that whenever we hear “the call” and follow it, many are blessed and find healing — including us. Then there is Joe Versus the Volcano . Joe Versus the Volcano is about a guy named Joe (played by Tom Hanks) who had once approached life with pluck and vitality but then somehow became afraid. In a play on words early in the movie, he assesses his situation. He is in his office holding up one of his shoes, the bottom of which is flapping open. The office secretary (played by Meg Ryan) comes in and says, “What’s with the shoe?” Joe answers somberly, “I’m losing my sole” (read “soul”). Joe had become a hypochondriac, or as he tells his doctor, he “began to not feel well all the time.” The doctor informs him that he has a “brain cloud” and gives him only six months to live. This is devastating news, but it also serves to give Joe a new sense of freedom. He quits his job and ponders how he will live the remainder of his life. Joe agrees and the adventure begins. After a day of buying clothes and supplies for the journey, including four deluxe steamer trunks, he flies to L.A. where he connects with the yacht which will sail him to the island of the volcano. The next morning, the yacht is engulfed by a typhoon and sent to the bottom of the ocean. All that survive are Joe, Patricia, and the four steamer trunks, which Joe lashes together to form a lifeboat. They are castaway on the ocean for days, Patricia unconscious all the while. Joe is bedraggled, wasted by sun, salt and sea. This is not what he had bargained for. Nevertheless, he has no complaint. One night, in a delirious state, he sees moon appear full and huge in the night sky. He falls to his knees in gratitude. “Dear God, whose name I do not know, thank you for my life. I forgot how big ... Thank you, thank you for my ...,” he prays, his voice trailing off as he collapses into unconsciousness. The steamer-trunk-lifeboat finally arrives at the island of the Waponies and Joe prepares to face the volcano. Patricia, who has now rediscovered her own sense of wonder wants to marry Joe and join him in the jump. He argues at first but then relents. As they stare into the fiery mouth he asks, “So, what are we hoping for here?” “A miracle,” she answers. And together they leap. But of course, that is not the end. A miracle does occur: the volcano spits them out into the ocean where they are reunited with the steamer trunks. Joe and Patricia resolve to face together whatever life sends and, as the final caption reads, they live happily ever after (it turns out that the “brain cloud” diagnosis was merely part of a false set-up by Mr. Graynemore). Joe Versus the Volcano reminds me of another story, an old Hasidic tale about a man and a volcano. The Baal Shem Tov (Master of the Good Name), a venerable old Jewish rebbe was dying and his son, Rebbe Hersh, was chosen to take over the movement. But Rebbe Hersh was reticent, feeling himself unworthy of the mantle of such leadership. One night in a dream, he spoke to the figure of his deceased father. “How can I serve God?” he begged. “Like this,” came the answer as the Baal Shem climbed a high mountain and threw himself into the abyss. In another dream on another night, the Baal Shem came again, but this time he appeared as a mountain afire, a million blazing fragments showering forth. “And like this, also,” he said. These stories ring true to me, for living truly and serving God (to serve God is to live truly) has always been about jumping into the gaping abyss of the volcano and taking the leap of abandonment into the will and love of God. It is a trial by fire. “Our God is a consuming fire,” says Moses (Deuteronomy 4:24), a fire which burns away the dross of our lives so that God might bring us forth as gold (Job 23:10). Jesus showed us that the way to life is not by holding on to it but by letting it go. He taught us that “whoever finds his life will lose it, and whoever loses his life for my sake will find it” (Matthew 10:39) and “What good is it for a man to gain the whole world, and yet lose or forfeit his very self?” (Luke 9:25). His whole life, even to the end, was an abandonment to the will of God. On the eve of His crucifixion, Jesus asked the Father that he might be delivered from that death, but submitted with these words, “Yet not as I will but as you will” (Matthew 26:39). And so, on Good Friday he climbed the mountain and leaped into the volcano. But he came bursting forth on Easter Sunday like a mountain afire, finding life for us all. The Apostle Paul understood this very well. Philippians 2 records an early hymn of the church which celebrates the leap of Christ, “who being in very nature God ... humbled himself and became obedient to death — even death on a cross!” And because of this, God exalted Jesus “and gave him the name that is above every name” (Philippians 2:6-11). In Philippians 3, Paul spoke of his own leap. All the things that he might have held on to for himself — pride, position, power — he gave up, declaring, “whatever was to my profit, I now consider loss for the sake of Christ” (v. 7). He had one burning desire, “to know Christ and the power of his resurrection and the fellowship of sharing in his sufferings” (v. 10). He wanted to share in the abandonment of himself with Christ in the blaze of suffering persecution for his sake and shoot out of the mountain with Christ in the radiance of resurrection power. For one must always accompany the other; leaping in and bursting forth, abandonment and resurrection. 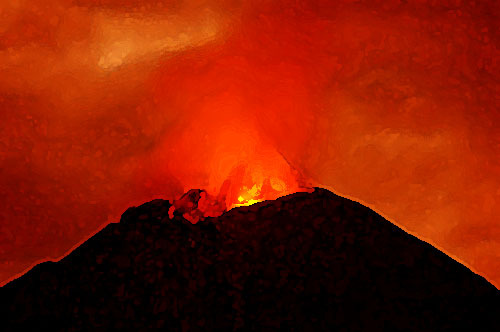 The volcano stands before us now and we must face it, for it is the only way to fullness of life. We must scale the mountain and stand upon the rim as the sparks and cinders fly upward, to stare into the abyss and abandon ourselves into the fiery love of God. Jesus stands beside us and takes our hand. So, what are we hoping for here? A miracle: the power of Jesus’ resurrection.